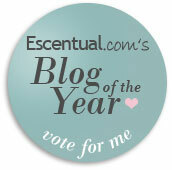 I'm delighted to have been nominated for Escentual.com's Blog of the Year Awards, hooray! If you're not familiar with Escentual.com, it's an online beauty retailer which stocks lots of lovely brands and has introduced innovative schemes such as their Try Before You Buy sampling service. The Awards are 100% voted for by blog readers and Escentual.com customers so if you've enjoyed reading Skin Deep throughout the last year, I'd really appreciate you continuing your support by voting for me. Voting is open until 1st February and literally takes a couple of seconds, simply click here for the link. Alternatively, you can click on the button on the right hand toolbar which will also take you directly to the site. Thanks so much!